Vertical storage solutions are trending and these index dividers are the latest to follow the movement. Vertical storage solutions are trending and these index dividers are the latest to follow the movement. The 5-Tab Index Dividers feature a write-on tab on top of the dividers, which works with pencil, ball point pen or permanent marker. The tabs gradually increase in size with each poly divider, making it possible to create more detailed descriptions or stagger the labels to make them easier to read. Not only can the tabs be used to identify the sections inside the binder, but color can be an easy visual way to categorize information. 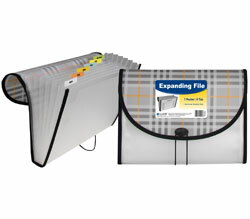 The brightly colored dividers are three-hole punched and open on two sides to reveal a storage pocket for 8-1/2 x 11 size documents. Load pages from the top or the binding edge to ensure the documents remain in place while stored inside 3-ring binders. Bright color assortment includes green, orange, purple, turquoise and yellow. 5/ST.